On February 3, 1988, Fred Leuchter received an unexpected visitor at his home in Boston, Massachusetts. A professor of French, Greek, Latin, as well as critic of testimonies, texts and documents from the University of Lyon II-Dr. Robert Faurisson-had an unusual assignment in mind: He wanted to persuade Leuchter, in his capacity as an expert in execution technology, to prepare a professional opinion to be used in a criminal trial then taking place in Toronto, Canada. More precisely, Dr. Faurisson wanted to convince Leuchter to determine whether or not the generally alleged mass exterminations with hydrogen cyanide gas in the concentration camps of the Third Reich were technically possible. Until that time, Leuchter had never questioned the existence of German homicidal gas chambers. When Prof. Faurisson showed him some mostly technical documents, however, Leuchter began to have doubts about the technical feasibility of the alleged homicidal gassings and agreed to come to Toronto to view additional documentation. Almost all the concentration camps of the Third Reich contained facilities for the disinfestation of lice carried by inmate clothing. Various methods were used to accomplish this objective: hot air, hot steam, several different poison gases, and towards the end of the war even microwaves. Delousing was urgently needed in particular because lice carry epidemic typhus, a disease with a history of repeated outbreaks in eastern and central Europe. Epidemic typhus appeared again during WWII where it claimed hundreds of thousands of victims, not only in the concentration camps and prisoner-of-war camps, but among soldiers at the front. Since WWI, the most effective and the most widely used means for the extermination of lice and other pests, was hydrogen cyanide, marketed under the trade-name Zyklon B. Fig. 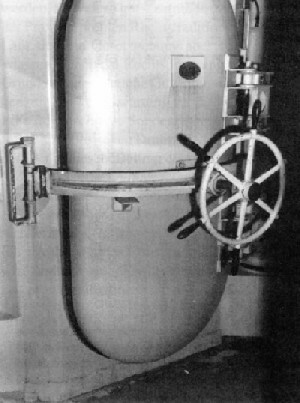 5: Single door to an execution gas chamber for one single person per gassing procedure (Baltimore, USA, 1954, technology from the 1930s). The execution of a single person with hydrogen cyanide is inevitably far more complicated and dangerous to the environment than the fumigation of clothing (even in a DEGESCH circulation chamber). Fig. 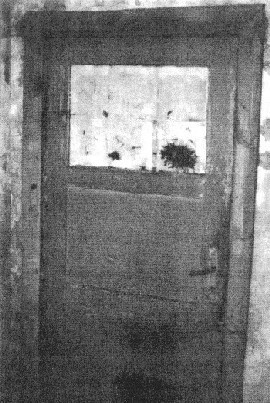 6: One of three doors from an alleged National Socialist gas chamber for the execution of hundreds of persons simultaneously, using Zyklon B (hydrogen cyanide) (crematorium I, Auschwitz, Poland, early 1940s). This door is neither of sturdy construction, nor is it air-tight (note the keyhole). It is partly glazed and opens inwards i.e., into the room, where corpses were allegedly piling up. It has been known for decades that the walls within the buildings in which Zyklon B is proved to have been used to delouse inmate clothing exhibit massive, blotchy, bluish discoloration. This blue discoloration is due to a chemical substance known as Iron Blue which, under the right conditions, is formed in a chemical reaction by hydrogen cyanide with certain components of masonry. This substance can still be observed in surviving delousing facilities today. It is obviously a very stable compound. Professor Faurisson was the first person to point out that this blue discoloration is absent from the supposed homicidal gas chambers at Auschwitz. Faurisson's idea was to analyze samples from the masonry in the alleged homicidal gas chambers for traces of poison gas or its compounds (cyanides) and compare them with samples taken from the delousing chambers. Fred Leuchter followed this suggestion when doing his on-site investigations in Auschwitz in 1988. "It is the best engineering opinion of this author that the alleged gas chambers at the inspected sites could not have then been, or now, be utilized or seriously considered to function as execution gas chambers." Shortly before Leuchter, another witness was questioned: Bill Armontrout, Warden of the Maximum Security Prison in Jefferson City, Missouri. It was Armontrout who, on request of defense attorney Barbara Kulaszka, pointed out that no one in the United States understood the operation of gas chambers better than Fred A. Leuchter. Armontrout himself confirmed in Court the great difficulties involved in killing people with poison gas, as Robert Faurisson had done before him. 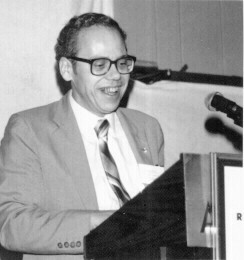 Following Leuchter, Prof. James Roth, director of a chemical laboratory in Massachusetts, also took the witness stand to describe the results of his analysis of the 32 masonry samples, the origins of which had been unknown to him: All samples taken from the gas chambers supposedly used for mass human extermination exhibited either no or only negligible traces of cyanide, while the sample from the delousing chambers taken for use as control purposes exhibited enormously high cyanide concentrations. Leuchter's report and subsequent testimony shook the foundations of Holocaust history, the story of the 'Nazi gas chambers'. Considering the tens of thousands of copies of this "Leuchter Report" that have been distributed in all major languages all over the world and the many speeches Leuchter held, the impact of the work of this one man was enormous. Alarmed by this development, the 'Never Forgive, Never Forget' brigade wasted no time in taking counter-measures. Self-styled 'Nazi hunter' Beate Klarsfeld announced that Fred Leuchter "has to understand that in denying the Holocaust, he cannot remain unpunished." Jewish organizations launched a vicious smear campaign to destroy not only his reputation, but his ability to make a living. Leading the charge was Shelly Shapiro and her group, "Holocaust Survivors and Friends in Pursuit of Justice". Calling Leuchter a fraud and impostor, this group claimed, despite better knowledge, that he lacked qualifications as an execution equipment specialist and had asserted the possession of professional qualifications which he had never earned. Although these accusations were entirely unfounded and failed to survive any legal verification, the 'get Leuchter' campaign, with the co-operation of mainstream journalists and editors, was successful. Leuchter's contracts with state authorities for the manufacture, installation, and servicing of execution hardware were cancelled. He was financially forced out of his home in Massachusetts and had to find private work elsewhere. No American has suffered more for his defiance of the Holocaust lobby. Re. background and course of the criminal proceedings cf. : R. Lenski, The Holocaust on Trial, Reporter Press, Decatur, Alabama 1990, abridged transcript of the trial against Ernst Zündel in Toronto 1988; Ger. : Der Holocaust vor Gericht, Samisdat Publishers Ltd., Toronto 1996 (online: www.zundelsite.org/german/lenski/lenskitoc.html); a lengthy compilation of the entire trial: Barbara Kulaszka (ed. ), Did Six Million Really Die? Report on the Evidence in the Canadian "False News" Trial of Ernst Zündel-1988, Samisdat Publishers Ltd., Toronto 1992 (online: www.zundelsite.org/english/dsmrd/dsmrdtoc.html). F. A. Leuchter, An Engineering Report on the alleged Execution Gas Chambers at Auschwitz, Birkenau and Majdanek, Poland, Samisdat Publishers Ltd., Toronto 1988, 195 pp. ; Ger. : Der erste Leuchter Report, ibid., 1988 (online: ihr.org/books/leuchter/leuchter.toc.html). Partially derived from Prof. Faurisson's description in: "Zum Zündel-Prozeß in Toronto, Teil 2. Vorgeschichte-Ablauf-Folgen", Deutschland in Geschichte und Gegenwart 36(4) (1988), pp. 4-10 (online: http://www.vho.org/D/DGG/Faurisson36_4.html) (hereafter abbreviated as DGG). This paragraph is again quoted acc. to Mark Weber, who gives no reference for this alleged quote of Beate Klarsfeld in his article op. cit. (note 10),. Cf. JHR, 12(4) (1992), pp. 421-492 (online: www.vho.org/GB/Journals/JHR/12/index.html#4).